On Tuesday May 20th, the Main (SLS) channel received the server maintenance package deployed to Magnum in week 20.This includes a bug fix for a networking-related issue that sometimes affects busy sims. Issues encountered during the deployment, but unrelated to it (see below) meant it had to be curtailed. The Magnum RC received a new project, which includes changes related to the ‘Experience Tools’ project. During the Server Beta meeting on Thursday May 22nd, Simon Linden, who identified the problem, gave a further explanation of Tuesday’s grid issues, which prevented people from logging-in to SL. Essentially, the log-in server was failing to give the viewer the correct token for it to connect to a region, so people actually got through the log-in phase when starting their viewer, but never connected to a region. “The conversation between the login server, your viewer and the region didn’t work any more,” Simon said. Maestro then added, “After logins were restored, there was a period where the inventory servers got pretty ‘heated up’, probably from people logging in after hours of downtime, so inventory was bad for an hour or two.” It was apparently at this point that the decision was taken to suspend the Main channel server deployment and resume the work on Wednesday May 21st, pushing the RC updates into Thursday. It is not anticipated that the problem will recur now it has been identified and rectified. The Grid Status page will carry the revised date and time of the work once it has been rescheduled. As noted in these pages, The Lab released its Oculus Rift project viewer to the public on Wednesday May 21st, with an announcement in the main blog. 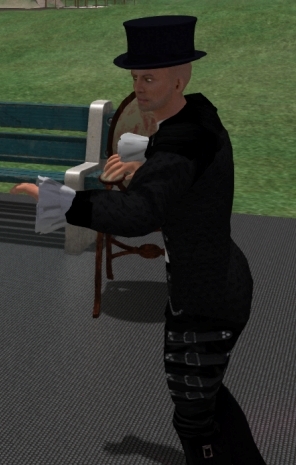 The viewer, version 3.7.8.289834, is aimed at getting people started on using the Oculus Rift in Second Life, rather than at providing a finished product with UI optimisations, and appears to be aimed towards encouraging early adopter of the Oculus Rift to try-out Second Life. The Sunshine / AIS v3 RC viewer returned to the release channel in the form of version 3.7.9.290131, referred to as “Sunshine v2”. These two viewer updates see the total number of release candidate viewers in the release channel rise to four once more. As also, details of updates in my Current Viewer Releases page. One of the required central updates for the group ban updates was deployed to Agni on Wednesday May 21st. A further update is needed before a server RC with the group ban code gets deployed, however. These updates are related to the central service to manage group bans. Not a lot to add here. As mentioned in part one of this report, Simon is now actively working on this functionality. He didn’t have too much to add during the Server Beta meeting, other than Maestro Linden has also been looking at the work Simon has done and has fixed a few issues. There’s still no date when the work might become visible for people to poke at. Talk of LSL functions for materials saw talk of LSL functions for lighting projectors resurface (see SCR-163), prompting Simon to ask, “Does anyone have ideas how people might cause trouble with the projector LSL functions? I wondering how it might cause problems, other than lots of updates … and if it would be any different from rezzing stuff?” Nothing of any serious impact could be identified, although it’s not clear whether the Lab will poke at that or not once the materials LSL functions have been sorted. BUG-5671 is actually a feature request, and concerns the provision of a check box in the viewer’s Parcel Properties so that all objects outside that parcel would be not be rendered for anyone within the parcel boundaries. The request appears to be for a server-side function, and the JIRA has seen some heated debate on the matter. So that’s another one to watch out for. On Friday May 16th, Black Dragon 2.3.9.8 was released on the world. The release is marked as “experimental”, and so some caution is advised in using it. It is also billed as a part-way release between the 2.3 and 2.4 versions of the viewer. The majority of the changes this time around are within the UI, although the version does pick-up on some new shiny from LL, notably the SL Share 2 capabilities for uploading text and photos to Twitter and photos to Flickr. Again, this isn’t intended as an in-depth review of the viewer, more a look at some of the highlights and give some initial feedback. The UI changes are immediately apparent on launching the viewer: the UI has moved more to a black schema, and system messages, etc., are by default in red. The result is quite striking, but at the same time I wonder how those with visual impairments will find the viewer at first glance. The most noticeable element of this version of the viewer when run for the first time, is new button placement area at the top left of the screen. This displays buttons where one would, in any other v3-based viewer, expect to find the Me, Comm, World, etc., menu options. The buttons are displayed in a new size of “Tiny”, and are immediately followed by the Dragon menu option, which provides access to the expected drop-down of menus (File, Edit View, World, etc). Right-clicking on these buttons displays the expected button options menu, and buttons can still be dragged and placed on the left or right of the screen or at the bottom of the screen, according to your own preference. It’s an interesting approach, and bearing in mind the current release is experimental, not entirely trouble-free, for me at least. By default, the Navigation & Favourites bar are enabled, but for me, the Navigation Bar didn’t display the region name or any details, and toggling to the Mini-location Bar caused it clash with the toolbar buttons, suggesting more work needs to be done in integrating the two sets of functions. Given the nature of the viewer, I’m not pointing to either item a fault, but rather something to be aware of should you try the viewer yourself and encounter similar oddities. Another interesting / useful little extra is the addition of five “spacer” buttons to the Toolbar button floater. Like the toolbar buttons, these can be dragged and dropped into any of the toolbar areas and used to break-up the buttons displayed within it into groups. As with the other buttons on the floater, note that each spacer can only be displayed (used) the once. Niran has undertaken a complete overhaul of the snapshot floater. Again, this still appears to be a work-in-progress, given the lack of a preview panel for viewing snaps, but what is there is likely to get some people bouncing in their seats. The most immediate change visible in the floater is the inclusion of buttons for the share to Facebook, Twitter and Flickr options. Clicking on any of these will launch the respective floater, thus offering a quick and easy way to swap from the snapshot floater should you wish to upload an image elsewhere. 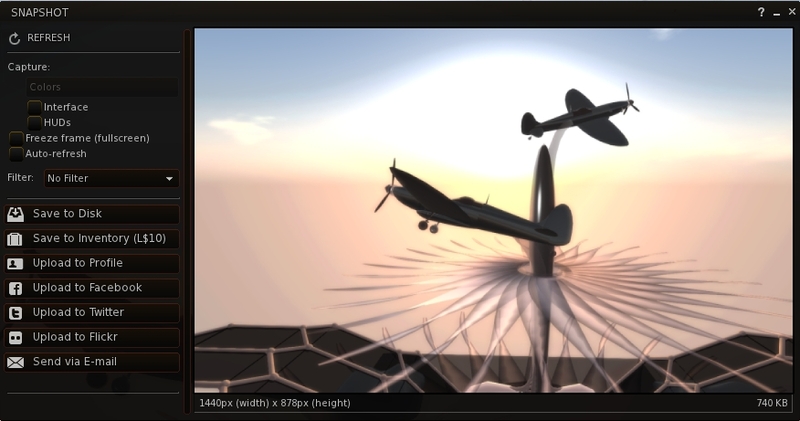 However, and perhaps more particularly for most people, Niran has incorporated the post-processing filters from the SL Share 2 viewer into the snapshot floater. 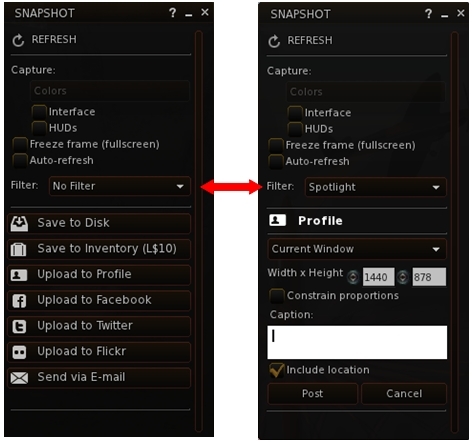 This means that when saving snapshots to disk, e-mail or your Profile feed, you can now apply any of the filters supplied with the SL Share 2 code (1970s colours, autocontrast, sepia, lens flare, etc., and Niran’s own “realblackandwite”). Clicking on the red bar to the right of the floater will open the preview pane – something which caught me out initially in looking at Black Dragon (and for some reason a trial click didn’t do anything – so my thanks to Maddy Gynoid for poking me on this and getting me to try again and revise this review as a result). 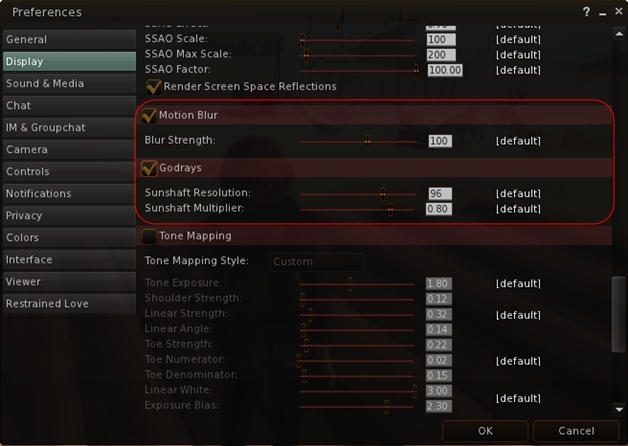 Black Dragon’s motion blur option is now on by default, and gets its own tuning options in Preferences > Display. Note that motion blur, while itself on by default, will only work when Deferred Rendering (now more commonly called “Advanced Lighting Model” in viewers) is enabled. However, Ambient Occlusion and Shadows do not need to be enabled. This release of Black Dragon also sees the Godrays option gain a toggle option in Preferences > Display, together with fine tuning sliders. Niran has produced a video demonstrating motion blur, embedded below, or you can travel to the Black Dragon office in Hippo Hollow and witness it first-hand using the viewer. Godrays, from Tofu Buzzard, were introduced with the last release of Black Dragon, but enabling them was a slightly convoluted process, as Niran hadn’t got around to adding a toggle function to them. The new option, together with the fine tuning sliders makes using Godrays much easier, and can, with the right windlight settings, produce some stunning effects, although (for me at least) it took some trial-and-error to get something reasonably usable, When used properly, it can add some stunning depth / feel to snapshots, although I did encounter something slightly unexpected when panning my camera around a sky build when I had Godrays enabled. Niran has always pushed the envelope with the viewer, and this release of Black Dragon is again ample demonstration of that. The fact that much of the UI is still a work-in-progress means that it would be unfair to pick at it at any length, given any issues that might be apparent could well be down to the fact that it is in a state of flux. That said, the new approach to the top bar areas of the viewer is interesting, and I’d like to see how that develops, vis getting things like the Navigation bar to correctly display. I’m not totally convinced about the toolbar button area sited to the top left screen; which it works fine for the “mini icons” setting, it does so only if your taste in buttons is minimal. Get to many, and they start wrapping. Use any of the other display options, and things can get a little messy up there very quickly. However, as mentioned above, it is the snapshot floater where Niran is to be given particular kudos; the inclusion of the SL Share 2 filters is an excellent addition. The overall design of the panel is something I wouldn’t mind seeing in other viewers; so hopefully it’ll be contributed back to LL and accepted.